Indian Prime Minister Narendra Modi is a divisive politician - loved and loathed in equal measure. The Bharatiya Janata Party (BJP) leader took over as the prime minister in May 2014 after leading his party to a spectacular general election win. Mr Modi, who had served as the chief minister of Gujarat from 2001, is regarded as a dynamic and efficient politician who helped make the western state an economic powerhouse. But he also is accused of doing little to stop the 2002 religious riots when more than 1,000 people, mostly Muslims, were killed - allegations he has consistently denied. Mr Modi became an international pariah after the riots - the US denied him visas and the UK cut off all ties with him. But a decade later, the controversial politician has been reintegrated into the political mainstream. Mr Modi's 18 months in power have been a mixed bag of hits and misses amid concerns over rising social tensions and intolerance. He has had luck on his side. Inflation has been tamed, and the fiscal deficit contained. For both, he should thank cheap commodity - mainly oil - prices. His government so far has been free of scandals, and he is making his ministers and bureaucrats work hard. Mr Modi has also launched a number of nationwide programmes to build smart cities, cleanliness and bridge the digital divide, but concerns remain about their effective implementation. He has unveiled a Make in India campaign which promises to cut red tape and aims to turn the country into a global manufacturing hub. Mr Modi has also energised India's foreign policy, openly courting countries like Japan, Australia, Israel, the US and now, the UK. Observers say he is mining the diaspora. But all of this is still - strangely - not translating into a resurgent economy: companies are not performing well, industrial output is flat, bank credit is languishing, the property market is gloomy. Messy taxation is putting off investors. A simpler and fairer land acquisition law - that many believe India badly needs to build infrastructure and industry - has become a lightning rod for discontent, and unless it gains bipartisan support, could be doomed to legislative limbo. Mr Modi's BJP has also suffered two humiliating defeats - in the Delhi and Bihar state elections - this year. And he has already faced a rebellion by some of the party's senior-most leaders who feel that the party has been "emasculated" under his leadership. A brilliant speaker, the Hindu hardline party's poster boy faced stiff internal differences when the BJP named him as its PM candidate for the 2014 vote. Mr Modi's rise to the top position took many by surprise. For years, his critics said he could never be prime minister because of his alleged role in the Gujarat riots. Although he has escaped censure so far, his close aide, Maya Kodnani, was convicted and sent to jail for 28 years. He has never expressed any remorse or offered any apologies for the riots, and many Muslims displaced by the violence continue to live in ghettos near Ahmedabad, Gujarat's largest city and commercial capital. Mr Modi's personal life has also been under scrutiny, with critics accusing him of deserting his wife, Jashodaben. He was 17 when the arranged marriage took place but the couple barely lived together. Mr Modi himself has always avoided questions about his personal life amid suggestions he wished to appear celibate for Hindu nationalist reasons. In the run-up to the election, he publicly admitted for the first time that he was married. 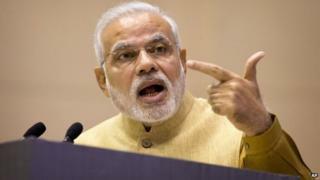 Analysts say the reason Mr Modi remains unscathed is the strong support he enjoys among senior leaders in the right-wing Hindu organisation, the Rashtriya Swayamsevak Sangh (RSS). The RSS, founded in the 1920s with a clear objective to make India a Hindu nation, functions as an ideological fountainhead to a host of hardline Hindu groups - including Mr Modi's BJP with which it has close ties. The RSS has a particularly strong base in Gujarat, and Mr Modi's ties to it were seen as a strength the organisation could tap into when he joined the state unit of the BJP in the 1980s. He got his big break in the public arena when his predecessor in the state was forced to step down in the fallout from the earthquake in January 2001 that killed nearly 20,000 people. And Mr Modi's colourful website beckons users in with more than a nod to his muscular nationalist campaign: "India First!" it proclaims to visitors.